A craftsman creating the inlay on a marble table top in Jaipur. 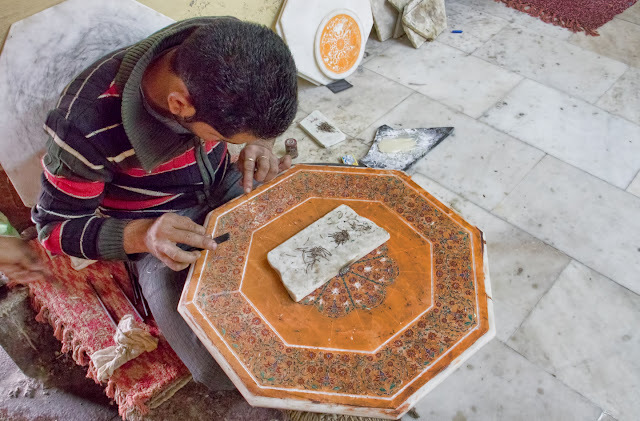 The orange color is henna; they paint the marble with it before cutting out the pattern to make it easier to see. Then tiny bits of semiprecious stones are laid into the cut stone and the henna comes off in the final polishing. I resisted all entreaties to have a lovely table of my very own shipped to me in New York -- I'm trying to have less stuff in my apartment, not more -- but I did break down and buy a tiny marble box with blue lapis elephants on it. I am a sucker for elephants.